I love Steve Carell. The guy just has one those faces that can make you laugh even at an unfunny joke, and that can make the good ones great. So, despite my better judgment, I’m sort of looking forward to Get Smart. That said, I have to wonder about the choice of hiding so much of Carell’s face in the poster. I understand the idea, but for me they are simply obscuring the movie’s greatest asset. The funny thing about Maxwell Smart is not just seeing him doing silly stuff. It’s also seeing his reaction as he tries to maintain an air of seriousness even as everything goes haywire. The hair joke gets in the way of that in here. One other side effect of the hair joke is that Anne ends up having to stand a bit in front of Carell, and doesn’t seem to even realize he is there. In the old Get Smart poster, which can be seen below, there was an interesting interaction and chemistry between Maxwell and Agent 99. The new poster completely lacks that. I still don’t think it’s a bad poster. But it is far from great and it wastes many of the best elements they had to sell the film. 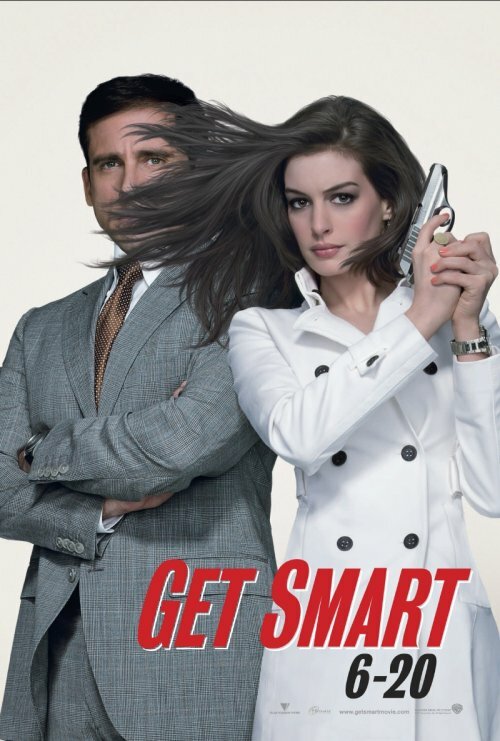 I think the new poster is the greatest poster of all because I like how Anne’s hair is in Carell’s face. One reason is because Anne Hathaway is beautiful and she makes a really good, Agent 99. Another reason is because she makes this movie come to life. Carell is funny, but he is better off doing voiceovers. The old poster lacks the capacity of the story. The new poster is AWESOME because I love how Anne is a little bit in front of Carell. The 2nd poster, the one with Carell’s tie in Anne’s face is terrible because it does not look as awesome as the 1st one because the poster is ugly.